I write at a very interesting time to be alive if you are interested or engaged in Social Housing, Welfare Reform, and the whole area of homelessness. Spring has just turned 3 years old and it’s been a whirlwind of challenges and activity during this period by anybody’s stretch of the imagination. We set up in the middle of the biggest Welfare Reforms since the benefit system’s true inception after the second world war. Many told me that we were foolish to do so with so many uncertainties in the sector, and there have been many occasions where I would have struggled to disagree. But I also remind myself that’s exactly why we set up Spring. Fundamental to us is that we wanted to go back to the original ethos of the social housing movement and work with those most in housing need, and secondly as an organisation not to be reliant on government or local authority contracts. Of those two statements, it can’t be denied that Spring houses those most at risk of homelessness. With over 550 lettings alone this year and over 770 people living in Spring accommodation as I write this, the need for the type of services Spring provides to vulnerable people is clearly evidenced. On the second point around 12% of our income derives from contracts with various local authorities in the Midlands, so I like to think we have stayed true to our original mission. The majority of our services are delivered within our supported housing stock. The term Supported Housing covers a range of different housing types, including group homes, hostels, refuges and supported living complexes. We give cautious welcome to the recent announcements from the Prime Minster on the future of supported housing and the proposals of the future funding arrangements from 2020 onwards. Firstly, it has to be helpful that long term services have been separated out. Older people services represent 71% of supported housing stock and this can sometimes cloud the overall issues. Short term services, which would include the vast majority of our homeless and young people at risk services, are still at the whim of local authority commissioning cycles and the challenges faced by local authorities in the full introduction of the Homeless Reduction Act, but we are in a better position than we were a month ago. So, as ever, the devil will be in the detail and we will need to fully understand the developing situation, but let us be grateful the government has at least recognised it as an issue. 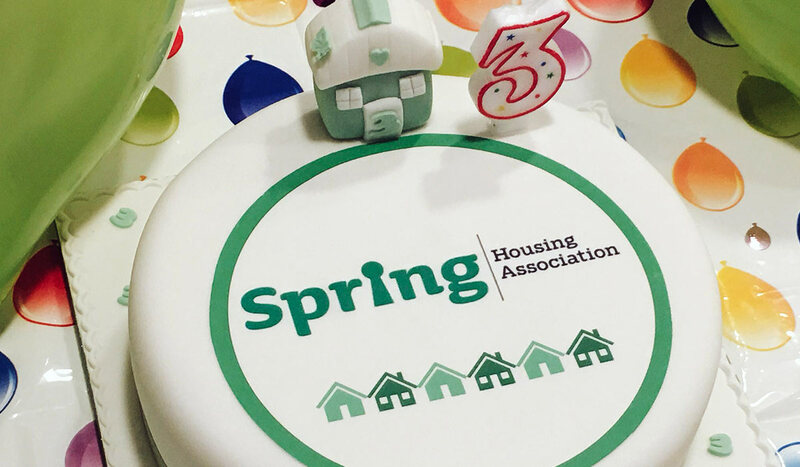 Over the past year Spring’s housing and support capacity has increased by 30% to meet growing demand. This hasn’t been without its challenges both from a governance and operational perspective and I’m lucky to be surrounded by such great colleagues in facilitating this over the past year. Hopefully many reading this will have seen our campaigns for more social rented homes (not to be confused with affordable homes, which remain unaffordable to a high percentage of the population we serve, and which subsequently drive people into poor quality private sector accommodation). Social rented homes would be a huge antidote to this problem and it remains Spring’s long-term ambition to develop more social rented homes as an increasing part of our portfolio. This year we have gone even further and created a “step up” housing scheme in Edgbaston, Birmingham. This service is aimed at people at risk of homelessness who are in work. Customers living here would certainly struggle to live and work in supported housing or most private sector housing due to the associated costs. There are no deposits, no fees, just rent and furnishings so they can have a good place to live in a city centre location. I haven’t heard of too many examples like this and we will be looking to increase the availability of this type of service in 2018-2020. We remain committed to working with young people and pleased to be working on the Youth Offer in Birmingham which will feed into the overall Birmingham Housing Strategy. A large proportion of the strategy looks at how use our housing stock in different ways. Shared housing has to be one of the tools available to housing association and local authorities – this way we won’t just be pulling up the social housing drawbridge on young people for generations to come. Spring Housing Association led a session in partnership with Birmingham City Council last week on a housing pathway model for care leavers supporting young people to be tenancy ready by their 18th birthday – seriously important work in preparing the tenants for the future! It’s definitely worth reading Crisis’s excellent report on shared living detailing some of the best practice up and down the country. Again, we are grateful that we are placed alongside some of the excellent practice from across the country: https://www.crisis.org.uk/media/237291/crisis_spare_to_share.pdf. It’s clear that the demand for shared accommodation is growing. A survey conducted by the National Housing Federation in May 2017 (representing responses from 69 housing associations) found that plans to develop new supported housing units had been reduced from 8,800 to 1,350 in the face of ongoing uncertainty about future income streams, representing a decrease of 85%. Add to that the appalling lack of social rented homes being built we are looking at a partly artificially-created housing crisis. Supported housing and social rented housing makes good economic sense. Supported housing delivers average net savings to the public purse of around £940 per resident per year. Depending on the type of scheme, the level of savings can be even greater; for example, for people with learning disabilities the saving is £6,764 per resident per year. Research undertaken in 2009 showed a net financial benefit of the Supporting People programme, to the tune of £3.41bn per year against an overall investment of £1.61bn. However, most of this has gone due to acute funding pressures for local authorities who now administer the funding without the dedicated ringfence in place. A new, sustainable approach to funding supported housing is needed to ensure the benefits of it are maximised, enabling the continuation of positive outcomes for the customers. The availability of specialist and supported housing is failing to keep up with existing or increasing future demand. As with social rented homes, it does require subsidy to build, but its one hell of an investment and, in turn, pays back multiple times over resulting in less housing benefit for the state, less poverty, and more importantly better life chances for people that live in them. All of the things that really do matter! It seems many housing associations are turning their backs on building social rented homes to please the latest government whims and to keep their banks at bay. Yes, it means higher grant levels are required but nobody can argue that there is a shortage of truly affordable homes. We are blessed at Spring that we have a board that focuses on need, which stands equally alongside viability and good governance as the cornerstones of our organisation. It allows us to innovate with our partners like the Homeless Foundation and help manage the iKozie, a well-engineered micro home that we currently let at LHA levels to the inspiring Kieran. As a sector, we have to do more. We are failing future generations with our self-interested approach to housing and social policy. We all turn a blind eye when developers renege on their social commitments; affordable housing plans are shelved as developers creep out of agreements, finding they won’t be profitable enough building affordable and social rented homes. Their argument is that some housing is better than no housing – and this is the choice that many local authorities face. It’s hard for us to say hand on heart that we are creating sustainable communities for the next generations to aspire to – however, that doesn’t mean that we won’t keep trying in our small way to continually make a difference. Its fantastic hearing stories of customers starting with Spring when they are unemployed, homeless, and unsettled and within 6-12 months they are employed, accessing the Rent Relief Scheme, moving into their own accommodation, and sustaining their tenancy with minimal support. This is what Spring is about and there are more and more of these examples becoming a reality as Spring grows and develops. I am so proud of the shared ethos of staff not hung up on a title or job description but truly embracing the needs of the customers which is what has led to the growth of services and diversification. This week, I was reminded that 10% of our workforce have previously been users of Spring’s services. I know that they have every intention of fighting for a better future for people who need good quality housing the most.